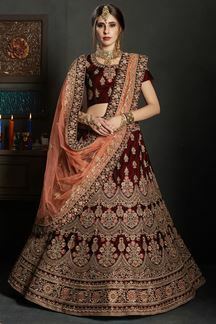 Make a transitional appeal dressed in this fetching maroon designer velvet lehenga choli set featuring a neckline enriched choli bearing motifs all over for décor while the lehenga falls in zari motifs at the top followed by resham & zari worked heavy embroidery all over giving it the maharaja beauty! This lehenga choli set is accompanied with contrasting orange net dupatta. Note: Color may slightly vary due to digital photography.